I ran two miles this morning with my running group and then I stupidly agreed to meet a friend at the health-food grocery store. There was a clever move. Did every date nut bar and tub of bulk granola look absolutely delicious? Or what? I ended up buying yogurt with cream on top, because I enjoy cardiac arrest as much as the next person, and also a big bag of nutritional yeast. I know, right? Party on, June. Nutritional yeast is absolutely delicious on popcorn. Marvin worked on a movie in San Francisco for a few weeks, and he came home raving about how the movie theaters put nutritional yeast on their popcorn. I had the same reaction you are having, which is, "Ew," but trust me, it's good. You just can't find nutritional yeast anywhere, is the thing. 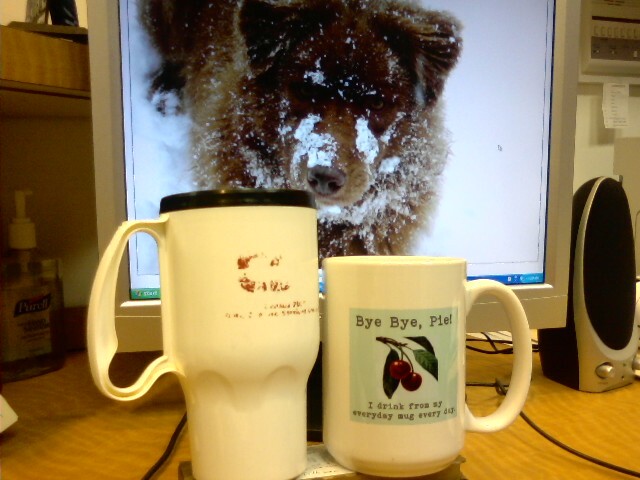 Moving beyond my yeast affection, two faithful readers have sent in photos of their Bye Bye, Pie mugs from June's fabulous designer collection of Bye Bye, Pie paraphernalia. Oh, and before I forget, my Aunt Mary said she ordered the dark t shirt with the new design? And the image came out really light. So I recommend not getting dark Ts with the new banner. I will remove them from the store. That's what they call your page on CafePress. Your store. Bugs me. I'm Mr. Hooper, over here, sweeping my stoop. What you want, Big Bird? I like how Trixie is trying to hypnotize the mug. "Turn into chicken! Mug be chicken now!" Oh! Also too? If anyone else is gonna send me their photo with their Bye Bye, Pie purchases, will you include the address to your blog in the email? That way I don't have to try to find you in the comments to see if you even HAVE a link. Merci. The reason you can't really read what is on her old mug is because the message is in hieroglyphics. I asked her if she got this mug from Cleopatra's blog, Bye Bye, Pyramid. It was really convenient when DB was commuting on the Ark, tho. My friend and former coworker, Hammy, is married to a guy who made her stop using those plastic commuter mugs, by the way. Apparently that particular type of plastic is really bad for you or something. Plus, in the case of DB in MD's mug, it's all scratched up from when T-Rexes drank from it first, which constantly used to cut her mouth. Okay, am over the "DB's mug was old" jokes. She got this when it was Free Mug Night at the chariot races. I guess that's all I have to tell you, anyway. The weekend yawns before me with nary a plan. I squeezed in all my activities before noon Saturday. I do have a copy of The Help, now, though, which is our book club selection this month. Click on Mince Words with June if you'd like the scuttlebutt. Although I mostly blame my scuttlebutt on my love of the McDonald's fries. Speaking of fries, have you seen that commercial for Ore-Ida? It's basically saying there's a recession and we're cutting back in so many ways, but dammit if I don't stick to my Ore-Ida fries no matter what. Because when we're poor, nothing's better for my family than frozen fried processed food. Oh, dear. Am seriously hoping Ore-Ida isn't one of my BlogHer sponsors. Things get so complicated when you sell out. P.S. I almost forgot. Faithful Reader Lee wanted me to tell all of you her Haitian kids are on their way! She adopted two Haitian children before the earthquake and they are fine and they are coming home. Previous Post How we write this blog? We has no thumb. In desperation I substituted a block of mashed tofu for ricotta cheese in my lasagne last year and no one knew. Then I did it again & fed it to company as an experiment. Not a peep or an odd look. Firm tofu + a little lemon juice + nutritional yeast + a handful of Italian herbs = a secret that would send people vomiting. Oops, forgot to change my name. Big, big Congratulations to Lee. I’ve been praying for her girls and their safe exit since she told us all. I wish her and her girls the very best in their new life together. I, watched the telethon, and the amount of newly orphaned little ones is staggering and heartbreaking. Here’s hoping international adoption restrictions and red tape will be eased up, so these precious babies can all be rescued from this tragedy. The Help is awesome. Can’t wait to read the comment. Wonderful news, Lee! We have a good friend that just flew into Haiti Thursday to see if Delta can take in larger planes. He said the destruction is unbelievable. He said Katrina destruction was nothing compared to this. Relief efforts are beginning to happen with food and water to the people. I was sitting in Barnes and Noble 2 evenings ago, trying to work; but I spent the entire time eavesdropping on a woman’s book club which was discussing The Help. So now I feel as though I’ve already read it. The front page of our paper today had a picture of a Boulder mom with her adorable 3-year-old son, just back from Pittsburg where the kids from his orphanage had been expedited to (now there’s a grammatically incorrect sentence). Anyway, I thought of Lee and hoped her girls were coming home also. I’m so glad to hear that they are. I hope she finds time in her new busy busy life to read BBP and keep us updated. June, I have an army green BBP t-shirt and didn’t notice that the logo seemed washed out. Congrats on a 2-mile run. And I will try the nutritional yeast on popcorn, if I can find any around here. Mother of Pearl, I used that mug for 10 years and it was bad for me?!! Well, that certainly explains a lot. Perhaps it was made of lead as they were wont to do back in the dark ages. See what I did there? I’m so happy to have provided you with so much comic fodder. Really. Now, I think I’ll buy a BBP t-shirt so I can e-mail you a photo of my new t-shirt next to my old one. On second thought, better not. Congratulations to Lee – that is wonderful news! Still snorting over your yeast affection. And mug jokes. Lee, you are the best! Gosh, we all are here for you. Just ask, and I’m sure if you need any help or just a good laugh, an old mug, some french fries (Haiti was a french colony….I really doubt french fries were ever served). Please let us know. And let me, let you know that, boy oh boy, you are tremendous! Happy, happy kid day, Lee! Terra and I have been worried ever since you told us here at BBP. I was hopeful after I heard the news report yesterday that they were expediting the adoptions to get the children to safety. Stop with the processed foods already, June. Do I have to recite the amount of bug parts and rat droppings allowable by the FDA in those things? Yucko. Joanna, you need to have further dialog with your body. It needs exercise, regardless of your age. And if you are over 50, it really isn’t an option: it is essential to maintain your strength and health. And speaking of health, I am SO very happy to hear about Lee’s girls. I hope she will send photos of them to June who will surely post them here. That wonderful man from Nashville and the photos of him adoring his little Haitian girl had to help the situation. This is really a ray of sunshine in an otherwise terrible tragedy. Fries are made from potatoes? Weird. I’m so happy Lee’s children are alright. Such a scary situation for all involved. I’m really trying not to buy a Bye Bye Pie mug because I have a favorite already. But every day I visit I’m left with less willpower. So happy for Lee and her kids! And if you really need fries and have no money, buy a bag of potatoes and make your own. I’m sorry I did not say it from the beginning. Congratulations Lee! Best wishes for full and happy hearts. Congratulations, Lee. As June knows, I am unable to emotionally digest trauma because I am a delicate flower. But I watched the Haiti telethon last night, and saw the first ever footage that I have seen of the disaster. And then broke into a million broken shards of sadness that I could not shake off for the rest of the night. And if I could scoop up as many Haitian children as I can (a) afford to feed and clothes and (b) fit in my SUV, I would taken them right now without a moments hesitation. So Lee is my hero. That’s all. Congratulations to Lee! I’m so happy her girls are coming home. 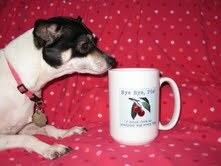 Love the chihuahua hypnotizing the mug! Our dog, Koty, gets that same look when he’s playing with his toys each morning…Even though he is a huge dog (part Bernese Mountain dog) and is almost 11, he plays with his “babies” every morning! I mean, he plays with his everyday toys, every day. And, many, many congratulations to Lee! Wonderful news! ok, so here goes. when i started commenting on your blog i was laura. then you had a commentor named laura b., which coincidentally ha, is my initial too, and also you have a laura c. so not be confused with the other laura’s, i became my alter ego duffylou, not to be confused with the lovely and popular d-lou. exhausted yet? i am. 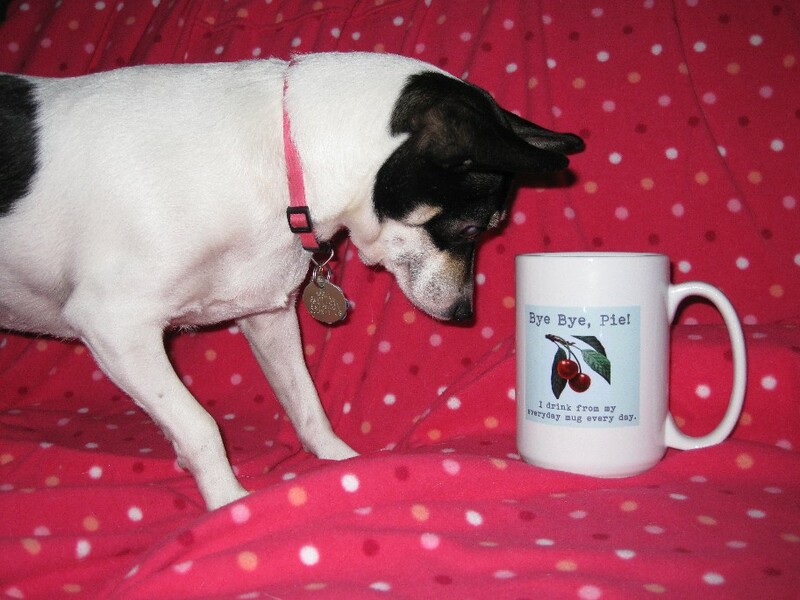 anyhoo, the picture of the adorable chihuahua hypnotizing the bye bye, pie! mug above belongs to me, laura, duffylou, who am i now? I have a funny story for you all. I met my aunt for lunch yesterday and she was telling me about her cat, The Fonz, got angry and peed on the kitchen counter on Thursday. Well Friday morning my aunt woke up to a horrible smell that had filled the entire house. She went downstairs and my uncle told her that the cat must have sat on the toaster and peed in it and that the pee must have leaked out onto the counter because the horrible odor started when he put his toast in the toaster. I’m happy to report that he did not consume the toast and that the toaster went into the trash. I’m also grateful that my dogs can’t climb on the counters because God only knows what they would do.